Unsolved Mystery. Weird Z0 behavior around build perimeter. Hey Guys! I've had a Rostock for a little over a year and have always had trouble printing all the way to the edge of my bed. We started chasing the problem a little more seriously with all of the experts at MRRF, and it's still eluding us. If I run a script that hits Z0 at the points in between each tower (indicated by A, B, and C in this picture) my head is perfect at the center, but about 2mm above the build plate everywhere else. 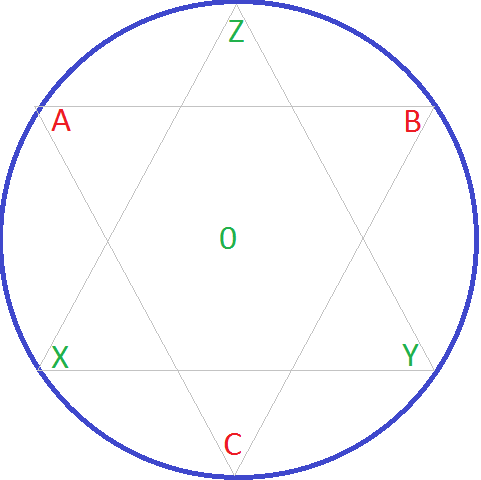 If I run a script that goes X, A, Z, B, Y, C (around the perimeter clockwise [that's anti-cyclonic for Gene]) The head will go back and forth between the perfect level point and the 2mm high point. I recently did the V1 to V2 conversion, and the problem followed. I was also concerned about the flatness of my build plate, so I switched from cheap window glass to a real borosilicate plate. So the wood is all new, and so is the build plate... What am I missing? Last edited by Jimustanguitar on Fri Sep 05, 2014 4:35 pm, edited 4 times in total. Re: Unsolved Mystery. Weird Z0 behavior. Are you using the stock arms and effector? The most likely issue, is incorrect geometry set in the firmware, either arm length, or one of the offsets. What is the script/g-code you running? As far as the mechanical setup goes, I've got the authentic molded SeeMeCNC carriage holder and platform with TL carbon arms. Even though I've measured them and confirmed the arms to be precisely 269mm, I have played with arm length, carriage offset, etc in the firmware as a test to no avail. Also cleared EEPROM, started with "fresh" firmware, etc. edit: This also pushed me to change my endstops from mechanical to the magnetic ( just the straight sensor, not the whole board) and use the firmware for the endstop offsets. It did increase my repeatability, but added in an variable for me to fret over (the implimentation of the software offset). If you do the same moves but smaller, say 50mm smaller star pattern, does the amount of error change or remain the same? If you go anti-clockwise does anything change? hmmmm, let's do some testing at the meeting Thursday, OK? will you be there with machine? Do you have a dial indicator? if not I can bring mine so we can get some measurable data. 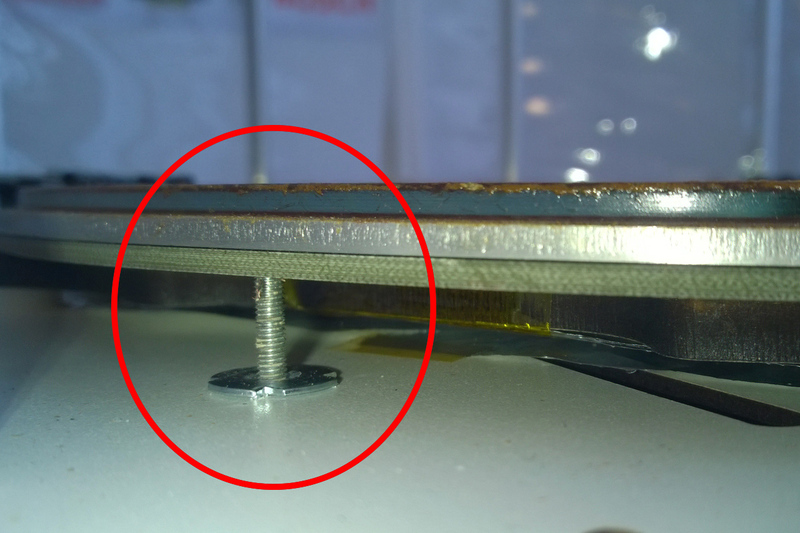 Did you put that mic-6 aluminum tooling plate on your bed so we know it is flat? I am thinking taking measurements at smaller and smaller star patterns (25mm increments) then putting that data in a spreadsheet to see if any pattern shows up. could be some weird math out at the travel extremes where the arm angle gets small. If that is true we should be able to 'predict' change and have firmware compensate depending on position. If it's a geometry issue, in all likely hood you'll see it arc between the good values, it'e the nature of how the Math works out. I'd would have guessed arm length, the carriage offsets don't really matter except in there contribution to computing delta radius, when you measured the arms I'm assuming you measured rotation center to rotation center? rather than end to end, and I assume you've compared them to each other. Another way to verify arm length is to print a say 50mmx50mm square and measure it, significantly incorrect values for arm length will result in print scale issues. Could also be tower positions, but it seems unlikely they would be out by enough to introduce a 2mm error. I also think you'd notice if your glass were warped by that amount. I have the same problem, but spots B and C are - 0.4mm lower then spot A - 1mm. I've bought a dial indicator and calibrated the X Y Z towers on 0.1mm accurate. Is it with your mechanic also everything all right? I have this exact same problem on my V1 as well, this is an exaggerated model showing exactly how it acts when printing near the outer edged of the build volume, by eyeball measurement the nozzle is probably around 1.0 to 1.5mm higher off the bed between the towers. Shizuma wrote: I have this exact same problem on my V1 as well, this is an exaggerated model showing exactly how it acts when printing near the outer edged of the build volume, by eyeball measurement the nozzle is probably around 1.0 to 1.5mm higher off the bed between the towers. have you find any solution? Nope, I haven't been able to find any solution to that problem, I just try to orient my prints so they are as close to the straight line between the center and towers as possible so it's less likely to cause a failed print. okey, with the same trick I have print my prints and every time I think that i can`t calibrate the Rostock. I hope that the guys from SeeMeCNC have an idea how to calibrate the Bed, than from 28cm diameter bed down to 10cm diameter its really not a great thing. I'm also confused as to why their calibration guide tells you to write the scripts to only go out about half way to the edge of the build diameter, I actually changed my scripts for calibrating to move it much closer to the outer edges of the build area which I seems to have better luck with calibration with those settings. The calibration guide's coordinates probably date to the smaller "Phebe II" PCB heater shipped with earlier Rostock MAXes. I have spent an extraordinary amount of time trying to get my printer to produce .1mm layers out to the perimeter. It has never delivered this reliably. I could print some wide things at .2mm if I lined them up a certain way, but most of the outskirts of the print surface are unsuitable for printing because the printer can never figure out how to position the effector over them. Maybe the delta arms are an uneven length. Maybe the radius delta is off. Maybe the towers are slanted just a touch, or perhaps the top plate is not directly over the bottom. One way or another, the carriages are moving too fast or not fast enough when the effector is far away from them. This is the problem that must be solved. I really hope SeeMeCNC is paying attention to this. It's been a problem for myself and many others since the beginning. We the users have collectively spent thousands of hours trying to figure this out, to no avail. I feel it appropriate that SeeMeCNC should now direct its full attention to solving this problem, which renders the printer unable to perform according to its advertised specifications. .05mm positional accuracy and an 11" build diameter are what we are supposed to get, but while either specification is true on its own, they are not true in concert. I would like to be repaid for the time and energy invested to get this printer operating on spec, with some reasonable way of getting the printer to perform on spec. To me, that means 0.1 - not 0.05, but only half that resolution - ALL the way out to the edge. I am willing to collaborate further, with end users or with SeeMeCNC staff, but I really need to see SeeMeCNC take a leadership position and drive this issue. User effort so far has produced small incremental improvements, but we need SeeMeCNC to do its part. Unless someone with a degree in robotics happens to saunter in, I don't see this ever getting solved without their help. 626Pilot wrote: I really hope SeeMeCNC is paying attention to this. It's been a problem for myself and many others since the beginning. John and Steve know about it and have been very good about working with me. We're all scratching our heads because with the new wood kit, there's not much that's left to replace... Nick Seward (RepRap Rainman, if you're not familiar) wasn't sure, I had some of the Kossel guys looking at it, Gene saw it too... The world experts really don't know. Hopefully our combined brainpower can get this straightened out. All of the lasercut wood is new. I checked that my aluminum extrusions were as straight as an arrow during the upgrade, the boro glass is sturdy and flat, the firmware is new... John also has tested the old arm squaring/leveling thing, and supposedly a 1/4" discrepancy did not cause a noticeable problem like some have described. It's got to be one of the few pieces I haven't changed yet, or some underlying bug in Repetier... I have a hard time believing that I have a faulty stepper motor or pulley, I can't believe that it's the Rambo board, and I can't imaging a scenario where a 608 bearing could cause this consistent of an error. We've got to be talking about arms, carriages, platform, u-joints, or electrons... I'm hoping to test my arm theory later this week, I'll keep you all posted. 626... Have you tested different firmware flavors? Can you confirm whether or not Marlin exhibits the same behavior? Last edited by Jimustanguitar on Mon Apr 14, 2014 10:57 pm, edited 1 time in total. I had Marlin set up for a short while as I was trying to get the automatic bed leveling sorted out, but I didn't try printing out to the perimeter. If anyone has PiCNC or a Smoothieboard running, it would be worth it to ask them what their experience has been with large-footprint objects. I think one of the more regular posters might have a Smoothieboard at this point, but I don't remember who. If we can get someone to confirm the same behavior on a Max that's running something other than Repetier, then I think we can conclude that it's unlikely to be a software bug. I suspect that the math is alright (as good as it can get, given limited floating point precision and clock cycles on ATMegas) but that the software's model of the physical printer does not match the actual printer. Nevertheless, assuming is not as good as testing and then excluding. I would want to see how other firmwares perform. It may be that hiring a consultant - someone who's worked for one of the "serious" industrial delta robot companies, like FANUC - is the only way to fix this. Even if their hourly rate is $500, it would be worth it to just get this irritating problem solved for once and for all. I would HAPPILY pay $500 if it meant I didn't have to go through everything I have. so do you think steve graber is able to print this because his arms are about 6inch outside the diameter of the print area and ours are right up against it? You know I had a problem that this reminds me of.... Not exactly the same so I cannot say if it's what you're seeing. In the end it turned out that I had (in an effort to NOT have to reverse the stepper directions in firmware) swapped the wrong wires on all of the stepper motors. It did calibrate, but had some really erratic issues like the center of the bed being nice, while the edges being way off. bubbasnow wrote: so do you think steve graber is able to print this because his arms are about 6inch outside the diameter of the print area and ours are right up against it? He does his supports in machined aluminum. Maybe that's better. I love how minimalistic and clever his designs are. It looks like you could knock the whole thing together in a couple of hours. It also looks like his arms are considerably longer than the diameter of the print bed. It's definitely geometrically different, but either way should work in theory. My MAX is still running Marlin firmware. I can do a extreme perimeter print and see how it does. I'll bring my machine on Thursday, yep. I've got a dial indicator, but I've never rigged up a way to mount it, so bring that setup if you have one. Sounds like a fun project, it'll be good to work on it with the experts! Brian, can you post your Marlin Firmware? I will test it on my Max.